Whether you choose to live in the big city of Buenos Aires, or choose a quiet place in the countryside, Argentina offers alternatives that meet your needs. 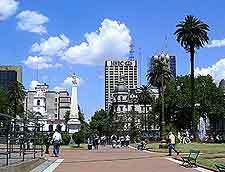 If you decide to retire to Argentina you can be assured that you will receive the most up-to-date healthcare available, if needed. In addition, not only is housing affordable, but will allow you to take advantage of the recent recession as well making this country the most ideal place to retire to. Argentina is not only a beautiful place to retire to, but has the most magnificent scenery in the world. With its warm and friendly people, its mountains and deserts, its incredible waterfalls, you can easily afford to live in comfort while enjoying the best that Argentina has to offer. Visit Argentina and become immersed in its cultural life. Rent a place for a month and explore all this country has to offer. Then you can decide whether or not you wish to retire there. With its centuries-old churches, sidewalk cafes, and enchanting countryside along with its great shopping and fine international cuisine, the decision to retire there may be made for you the first week you arrive. Known for its sophistication and energetic style, retiring to Argentina will afford you the opportunity to meet neighbors who emigrated from Europe; participate in sports, if you happen to be a soccer enthusiast, and become part of a culture that mirrors Europe but is less expensive and more within your retirement budget. Retire to Argentina and enjoy the nation’s capital of Buenos Aires which houses one of the finest opera houses in the world. Love to dance? The Tango is the national dance and is described as “a dance of intimate separation and common rhythm, combining both an elegant reserve and an exuberant passion. ”This is the essence of Argentina, its people, neighborhoods, culture, and beauty. Tango anyone? If you plan to retire to Buenos Aires, you will find it is composed of many small places encompassing profound details. Amid the glass skyscrapers casting their shadows on 19th century Victorian houses; tango bars and a treasure trove of antique shops which line the streets, retire to Buenos Aires and live it up! A valid passport is required for U.S.citizens to enter Argentina. 90 days for tourism or business. of Buenos Aires. The main telephone is (54) (11) 5777-4533.